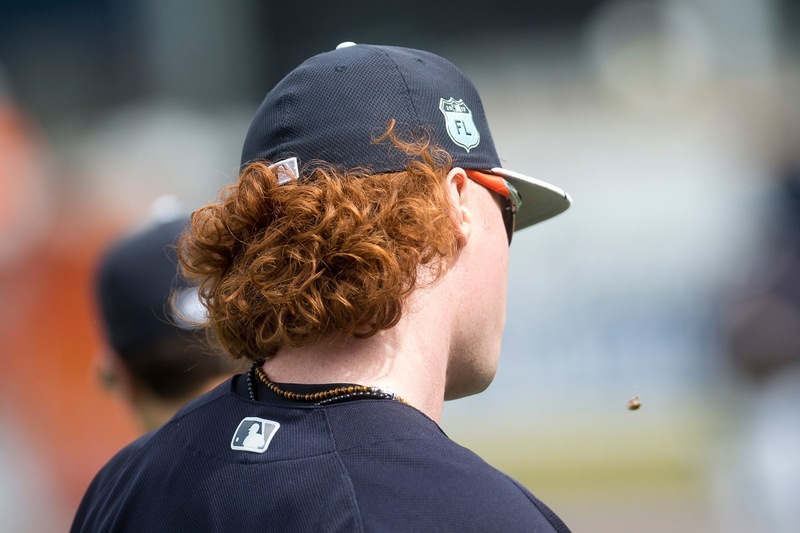 Yankees' number two prospect Clint Frazier was the prized jewel of the 2016 Andrew Miller trade, with a bodacious attitude to go along with fiery red hair, he was instantly popular among the New York faithful. Although he was unmistakably talented, with "legendary bat speed," according to GM Brian Cashman, the young outfielder was unpolished, and that mane was getting more attention in spring training than his play, and he would spend the beginning of the season in the minors. 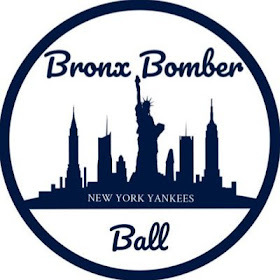 However, as bad luck would have it, and three outfield injuries later, the newest addition to the baby bombers made his debut July 1st at the Houston Astros. The number two prospect backed up his big personality with a memorable debut, going 2-4 with a double and a home run. 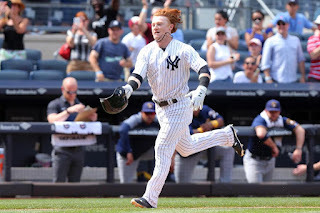 His hot start didn’t end there, after going without a hit in a short two game series against the Blue Jays, Clint Jackson Frazier rebounded with five hits in three games with two triples and two homers, including a dramatic walk off home run against the Brewers. This stretch of games would raise his batting average from an underwhelming .188 to .300. 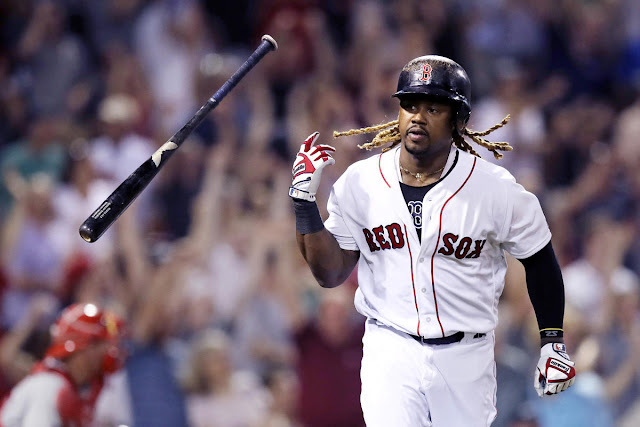 This early success would continue until the beginning of the Tampa Bay series on July 27th, where the left fielder saw his batting average fall from .284 to .243 in 10 games, ultimately finding himself on the 10-day DL with an oblique injury. As the young slugger gets his rest, let's take a look at his first stint as a Major League Baseball player. Before the ten game cold streak, Frazier was .290/.306/.565 with six 2B, two 3B, and three RBI in 72 AB. After that, he was .167/.222/.333 with two 2B, one 3B, one HR, and one RBI in 38 AB, so there was a dip in production. Looking closer at the numbers, Frazier was hitting a .362 BABIP (batting average on balls in play) with a strikeout percentage of 27.8%. After that, it dropped to .222 BABIP and 31.1%, so he was striking out slightly more, but his balls in play were outs a third more of the time than before. Next, let's look at his plate discipline. His contact rate was pretty steady, hovering in the mid 70% range, and swing rate only went slightly up, 49.5% to 52.3%. His swings on strikes going from 76.5% to 78.9%, but he's swung at outside pitches from 23.8% to 33.7%. Frazier was starting to swing at more balls out of the zone, and pitchers took notice throwing out of the zone 8% more. As for pitch location, Frazier seemed to have started to struggle hitting balls at the edges of the plate as well. These numbers give some explanation of the strikeout numbers, but as for the drop in BABIP, it doesn't tell the whole story. The main reason for the drop in BABIP is swinging at pitches out of the zone. Swinging at bad pitches are not going to produce solid contact, and it showed in how hard he hit the ball. Clint is known for his bat speed, and it showed early with 48% of his hits classified as hard, and 36% medium speed. It would dip to 28.6% hard, and 42.9% medium, so the balls he did make contact on were softer. Frazier's fly ball, line drive, and ground ball percentages stayed pretty steady, but his infield fly and infield hit percentage got moderately worse. All of those support the idea that he is hitting the ball softer and less in the gaps. When in the field, Frazier played all but five of his non-DH starts in left field, where he made several highlight reel catches, which could cause some to think he excelled. However, that is not the case, during that 26 game span in total he had two errors in 43 chances, which puts him at a .953 fielding average, which is .036 less than the league average at his position. 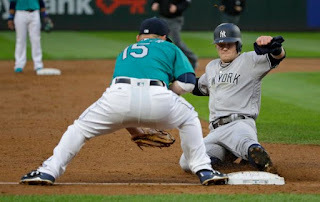 Frazier cost the team one run over the 26 games versus the league average at his position, which projects to -29 runs on a season game season. That one run cost is attributed to a throw, which lines up with what Triple-A manager Al Pedrique stated on what Frazier needs to improve on, working on hitting the cutoff man and his routes to balls. 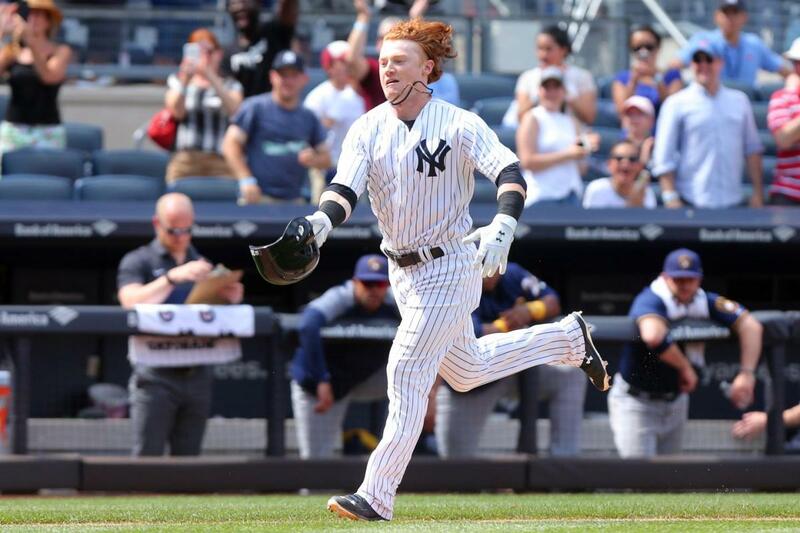 Clint Frazier’s base running is something that fans get excited about, as he runs with an aggressiveness that matches his personality, routinely trying to stretch his hits. Frazier said this about his base running back in July against Boston in a postgame interview, “One of the biggest things I’ve tried to remember is my at-bat isn’t over once I reach first base. I know how it is playing the outfield, so I want to be the guy that’s always trying to run in other guy’s faces to force a good throw. 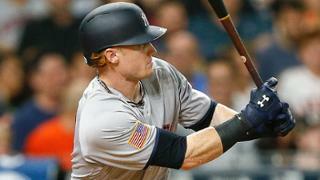 Up here they’re not going to knock you for being aggressive as long as it’s a smart play.” However, he has a -0.2 base running runs earned below average, but that should improve with experience, and the chances that come with these extra base hits are crucial to the team's success moving forward. His bold base running style can be improved, but the Yankees seem to love his aggressiveness, so it doesn’t look that big of an issue at the current time. To put all of this in context, this is a minimal sample size for a young and raw player who we will probably see again once the September call ups come around. On top of that, Frazier was working on improving his swing by keeping his weight more on his back foot. The outfielder would finish up his first stint with a 0.1 WAR, which is not great, but again, it's way too early to make any judgments on him. 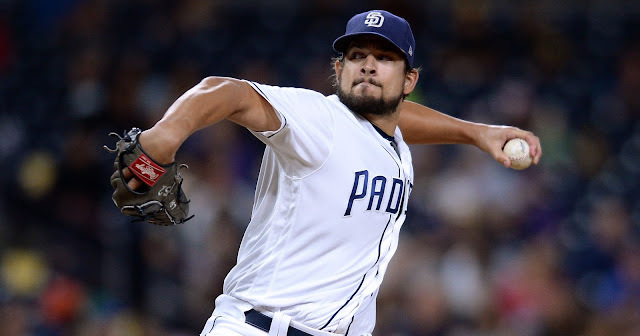 Clint was able to show he can play with the boys in the big leagues at a high level, but now he needs to refine his game so he can do it on a consistent basis. The promising outfielder looks to be a future spark plug with his aggressive style. His short demotion should be a great help in improving the weaknesses in his game, which will come in handy in the near future.